Old friends – or I guess die-hard blog readers, of which I don’t think I have many/any – will know that last summer, I climbed the Inca Trail with an awesome international adventure tour company, G Adventures. I loved my first experience with this company for many reasons: great local guides, good routes and accommodations, other fantastic travelers in the group and a focus on the local peoples of the region. Not just exposing us tourists to locals, but also to making a difference around the world through the company’s nonprofit branch. Anyway, when I was looking forward to doing this trip, I knew that I wanted to go to Turkey, and not just stop in Istanbul, which I could have done on my own easily enough. I wanted to see Turkey. For many reasons, I was pretty sure as a blonde American girl traveling alone, it would be complicated and difficult to see all of the country the way I wanted to, if not a little dangerous. A good deal at Christmas time ended up pushing me over the edge, and I chose to purchase the 15 day, Turkey On a Budget trip through G Adventures once again. Man, oh man, am I glad I booked this trip! I didn’t know much about what to expect in Turkey, besides being drawn to the place that has been at the crossroads of cultures and crux of the ancient world: the place where East meets West, where ancient Christianity thrived and grew, then was replaced by Sultans and Islam for hundreds of years. It’s the Middle East – a region I have always been fascinated by – but with a heavy touch of Europe. A blend I was so excited to experience and explore. Walking out of the hotel in the historic peninsula of Istanbul, I was immediately enthralled by all of the colors, the patterns, the textures and the designs. From colorful mosaic lamps hanging in store windows, to heavy tapestries and pillows in the low chairs of restaurants, then all of the colorful tiles covering the walls of the palace and all of the scarves. Throughout this trip, any time I saw something lovely that I wanted to take home with me, like jewelry, scarves and tapestries, I reminded myself 'You're going to Turkey, just wait for Turkey' and I am so glad I did. I stocked up on beautiful things for my body and home, all of it sent home before I left Istanbul at the end of the trip. The two week tour, which looped around the western side of Turkey, started off in Istanbul. I was so excited to arrive there, and I was not disappointed. But I do remember being taken aback upon arriving; I was not fully mentally prepared for visiting a Muslim country. Walking out into baggage claim in the airport, I found myself tugging the scarf I was wearing from a knot around my neck and laying it across my shoulders, looking at all the heavily-clothed women all around me and worrying at being offensive or insensitive. I soon realized that Turkey’s version of Islam is pretty laid back in comparison to most of the Middle East – religion and rules for behavior based on Islam are not required by the secular state at all, for example – and most of these more conservative women were other tourists form other Muslim countries. Once you leave Istanbul, the amount of women actually wearing the hijab drops, in the western region of the country at least. Inside the Spice Market, an overwhelming immersion into all the senses. Istanbul is so many things. It is European, but you can feel the change of cultures and histories inlaid around every street corner. The streets are crowded with the most diverse array of people from all over the world I have ever encountered. 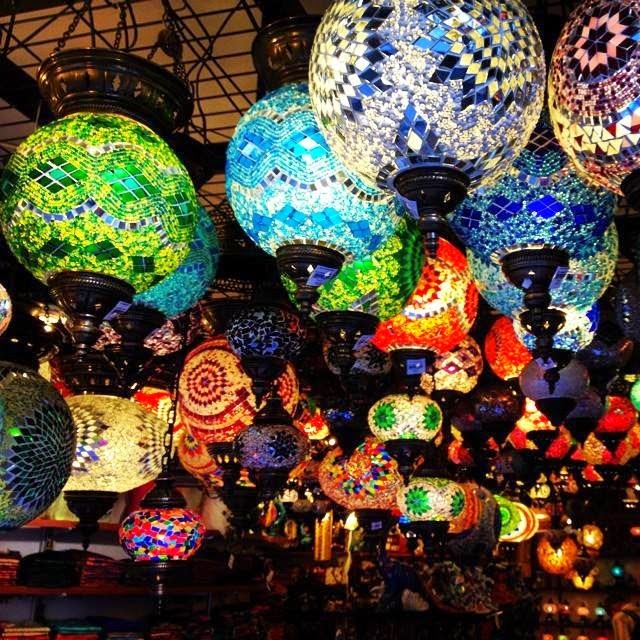 Turkish Delight and spice shops sparkle with bright fluorescent lighting, next to holes in the wall selling all kinds of tourist memorabilia. Everywhere you go, there is someone calling out to you “Lady! Yes, please come look!”, “Excuse me, can I ask you a question please?”, “California girl, come and see this!” (How they correctly guessed California more than once I’ll never know because I didn’t stop to ask). And if you’re too polite to walk by without making eye contact you find yourself in a rug shop, with up to five Turkish men unrolling 20 to 30 rugs before you with a flourish, pushing another glass cup of tea into your hands, no matter how much you decline. From the historic city center, as the streets wind round and round each other and thousands of people shove past, you can look across the main square and see the most impressive Catholic church of the ancient world, the Ayasofia, then turn around to see the Blue Mosque, just as massive and imposing. Their minaret's face each other, and several times throughout the day the call to prayer rings through the streets of the city, a soothing, mysterious routine from the earliest hours of morning until late in the night. For a long time both of these structures were mosques, but after Turkey gained independence, the state resorted a few of the spectacular mosaics in the Ayasofia and turned it into a museum, It is an incredible mash-up of the two religions, with the huge signs blessing Allah still hanging, and the intricate images of Jesus, as well as Constantine and other city leaders during the Byzantine Empire have been uncovered and restored on the walls. teachers spoke to the people. On that Friday afternoon in September, the lines for the Blue Mosque reached around the entire building, passed signs asking tourists not to kiss and for women to please stop and put on scarves and long skirts before entering the building. I ended up visiting the Mosque later, close to the time they were about to close for prayer times. It was a rushed walk, and all of the tourists taking selfies in their head scarves distracted from the beauty and tranquility of the place as it was. I learned in Turkey that mosques are possibly the most comfortable places of worship in the world, with spongy, soft carpets and it is totally acceptable to flop down onto them and sit for a few minutes, or kneel and pray. The Blue Mosque is truly incredible: cavernous with spectacular painting and design, lamps hanging from the high ceilings. During prayer times, I'm sure it is a very spiritual special place to pray. the incredible details of this space, though. Then there is the Topkapı Palace – where the elite of Istanbul lived for centuries. Inside the Harem, the Sultan’s private home, there are walls of the most beautiful tiles, raised beds and couches beneath rich tapestries and velvets. It has all the detailing, richness and opulence one would expect, though the signage with information leaves something to be desired. They just finished restoring the kitchens of the palace as well, which used to feed the thousands of people who lived within the palace walls. I didn’t have as much time in the city as I would have liked – I originally thought I had to hurry off to the UK, and bought a plane ticket to London accordingly. Because of this, I never got to see the Asia side of the city, or really much of anything beyond the historic peninsula, which one could wander for a week alone. Between the Spice Market, Grand Bazar, the Topkapı Palace and the plethora of museums to visit, I was enthralled by Istanbul, everything it had been and everything it could be. Basically, I can't wait to go back one day. But we had other places to get to on our tour, and after a day and a half in Istanbul, we were on the road.